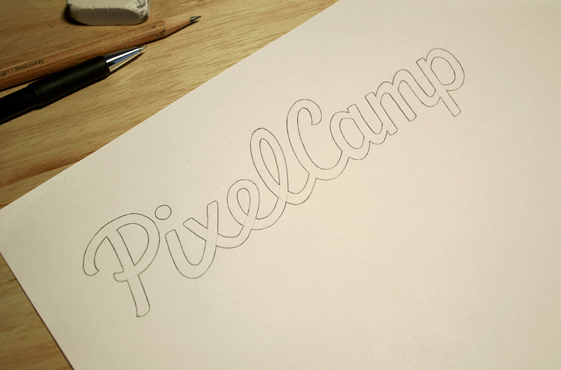 PixelCamp custom typography logo design. 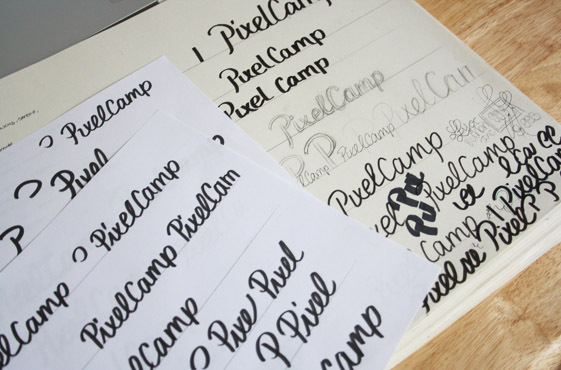 Based in the USA, PixelCamp is an upcoming web & mobile platform offering website design tutorials. The name reflects the outdoor retreat theme at the heart of the company identity, so one of the main goals was to suggest this idea of camping, nature, getting away, etc. Visually, one of the key references was sign lettering, like one would imagine on a wooden sign for a national park. At the same time, the script needed to have a strong, solid, clean and overall masculine feel — not at all ornate or childish. In terms of technical requirements, clear reproduction at small sizes was very important as a mobile application was one of the intended uses. Above: Rough exploration sketches using mostly thick markers and brush pens. Upon discussing the brief and reference images, we decided to focus on a design with a straight baseline, minimal stroke contrast and not overly slanted. 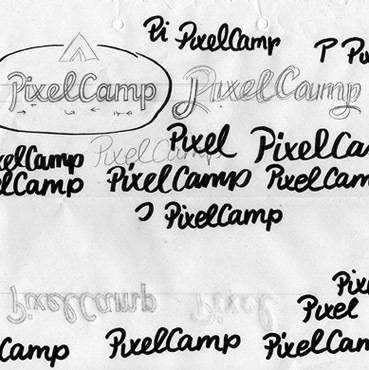 I drew out multiple quick versions of the name to get a feel for the letters and how they fit together. From then, I re-worked a couple of the best versions in pencil, developing two variations within the same approach. The first was quite geometric and angular with a monoline weight, while the second was a little more organic with subtle curves in the stroke terminals. Above: Refining the initial concept proposals. We went with the second version as the discreet stroke contrast has more personality and a more natural feel. However, it was a little too informal and casual, resembling handwriting a little more than sign lettering. 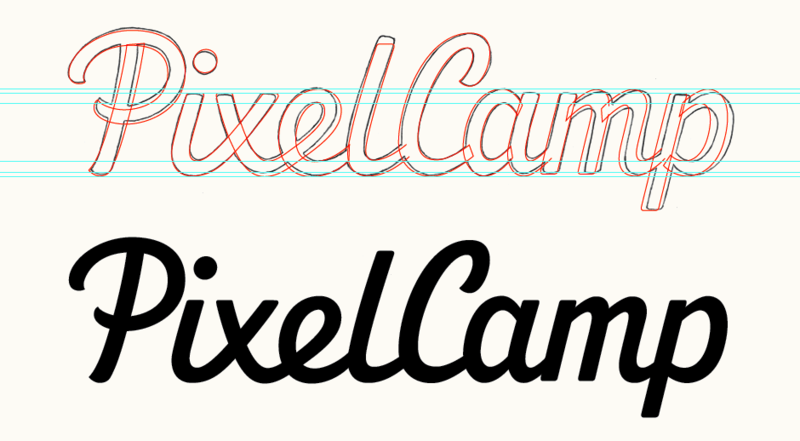 Removing the tail on the 'i' and making the angles more consistent were the first major revisions (top right). Similarly, the loop 'L' would become a straight stem instead, also accentuating a sturdy, more serious feel. With this the approved direction, I then outlined some issues that would need considering in the next step, with the help of some excellent feedback. Above: Writing notes directly on the sketch helps to remember the areas that will need fixing digitally. Working over the sketch, I then developed the first electronic draft. Here, I focused on creating continuity throughout the word without taking away from the distinctive nature of the lettering. Maintaining a consistent slope angle proved quite tricky in certain areas. For instance, as the 'e' is directly connected from the 'x', that leaves much less flexibility for adjusting the angle/shape of its bowl and counterspace. Similarly, the first 'P' has a slight curve in its stem, adding a sense of movement and character to the uppercase, but at the same time it needed some consistency with the angle of the lowercase 'p'. Above: Screenshot of the vector outlines drawn over the final sketch. We had discussed the integration of a tagline using a typeface planned for other visual applications. As well as wording and style variations to the tagline, I also tried a lettering alternate with a little brush style 'flick' on the top right bar of 'x' and the descender of 'p' (bottom right). While it did bring in some nice continuity, it added a little too much flourish and didn't work as well when small. Above: Early tagline settings, before adjustments were made to the spacing and wording. The major concern that emerged from the first draft was a slight difference in style and overall look between both words. 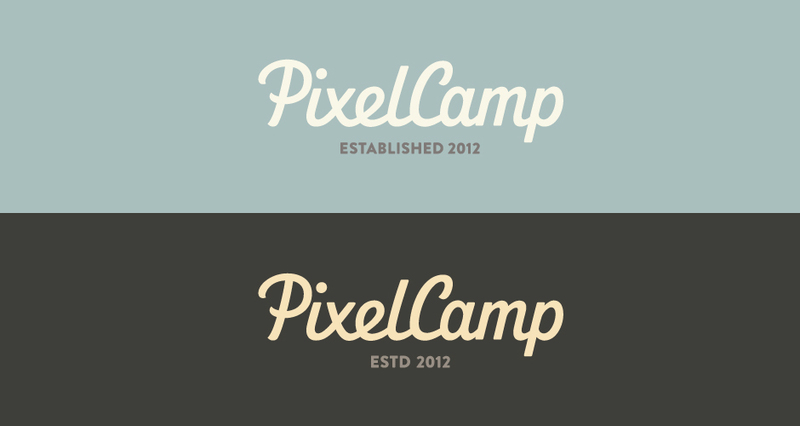 With its distinctive 'i-x-e' connection, 'Pixel' was smooth and flowing, while 'Camp' was straighter and more angular (see the discussion on Dribbble). Changing the junctions between the vertical stems and the arches in 'amp' from angled to smooth connections helped to tone down the sharper feel of that word. Above: Changes to the junctions circled in blue and other adjustments (inclination, curve shapes, spacing, etc.) in red. In addition to the lettering itself, final revisions included spacing and size adjustments to the chosen tagline and its shortened version along with some colour combinations. Claire is an amazingly talented letterer and identity designer who is an absolute pleasure to work with. 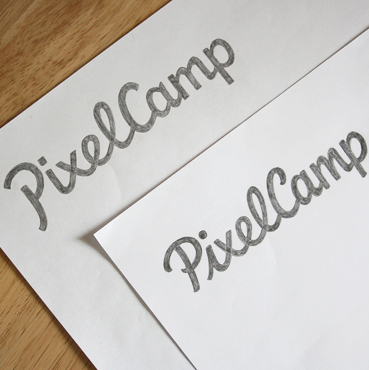 Her ability to respond to my initial vision with an amazing concept and her willingness to sweat the tiny details until things were just right has resulted in a beautiful, memorable mark that gives PixelCamp a voice.